blog.HalloweenAdventure.com | Latest News from the Costumes Trend FrontLines! : Are You Ready for St Patrick's Day? Are You Ready for St Patrick's Day? We might not be Irish, but that doesn't mean that here at Halloween Adventure, we can't enjoy St. Patrick's Day! In fact, we adore the holiday - you know us, we'll take any excuse to get dressed up! Even better, we'll take any excuse to deck the halls. 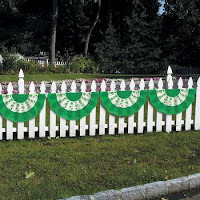 In our case, that means purchasing a whole bunch of green decorations, like this St. Patrick's Day Bunting Garland, as well as a variety of other decorations for the specifically St. Patty's day themed section of our site. Our favorite costume is an Adult Leprechaunoutfit with an oversized head. Don't worry, the headpiece has see-through mesh eyes, so you won't be stumbling around like a blind man. You will, however, be attracting the attention of all those around you in your fantastically realistic looking getup! Trust us, this is one HILARIOUS outfit you can't afford to miss! Girls can take part in the fun as well with our fabulously green Leprechaun Child Costume. This outfit isn't too over the top, so she could wear it to school or to a party at her friend's house and feel totally fabulous. It includes a green dress, black jacket, and leprechaun belt and matching hat. Voila, you've gone green! Boys will love our funny (and way more over the top) version! This yellow and green confection is PERFECT for the class clown- it even includes a hilarious beard! The hat and the outfit are all there. It's the best way to celebrate while still having a good time. Even toddlers can get in on the fun withthis comfy adorable green outfit! It includes a little green velvet jacket, with matching hat and belted detail. Perfect for the tot who loves to play dress up! Go off and hunt for the gold at the end of the rainbow! We'll see you there! Check it out - there's sure to be something for you, whether you're looking to decorate or to dress up!